I have recently been quite inspired by the various knit and crochet projects coming from the fans of the new “Outlander” show. I read the first few books long ago, and I admit I have yet to watch the show, but the patterns and the photos are incredibly inspiring! 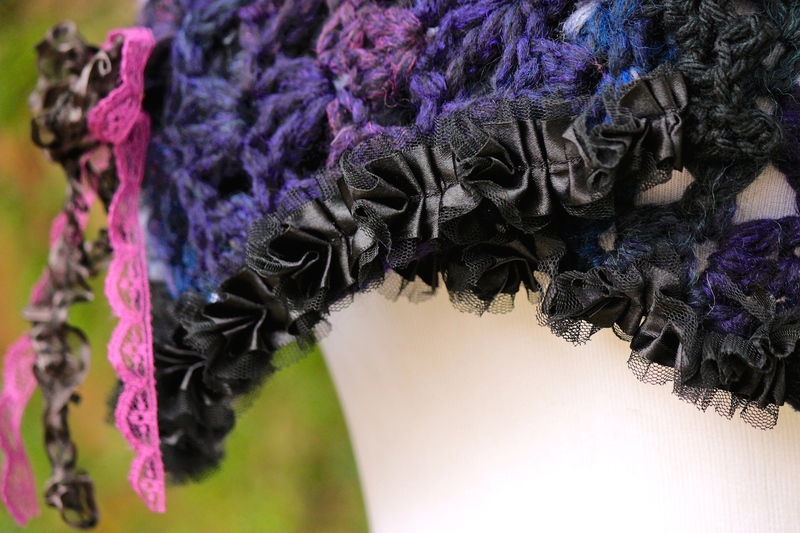 What’s more, the costume designer purchase many of the knit pieces on Etsy! You just never know who is going to be buying your items! ….But I digress. There are some groups on Facebook dedicated to recreating the pieces on the show, but they also share similarly inspired pieces and patterns. Amazing resources for those of us fibrefreaks who can’t get collect enough patterns! I recently decided to experiment with a new yarn and crochet a capelet. I was thinking it may look traditional, perhaps a little victorian….. 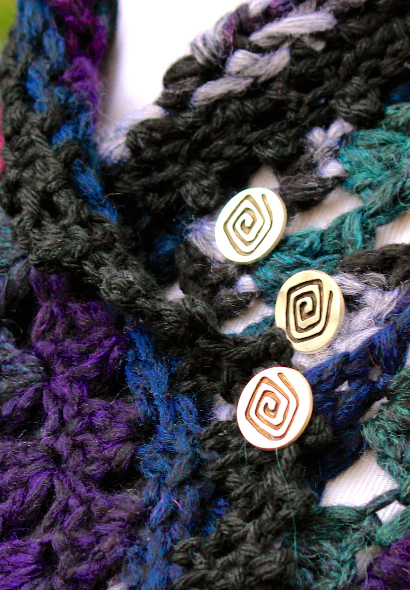 It started as a simple plan…crochet a smallish rectangle and add a button or two. …but it became much bigger than that! The colours in my experimental just-want-to-see-if-this-pattern-idea-will-work yarn turned out to be quite lovely and they deserved….nay, they demanded more than a simple button. In the end, they required lace crocheted borders, ribbon/netting lace edging, three of my favourite metal spiral buttons and a removable bow. For the first time in a long time, I had to pull out my sewing machine! And it felt amazing! You may think that crocheting this piece was the hardest part of this project. The yarn was quite bulky and the rectangular body crocheted up in a couple of hours tops. 1) Choosing the lace to use for the edging…. I had no idea I had SO MANY different types of lace in that wee little drawer! And to make it even more difficult, I only needed two small pieces so even the remnants of lace gone-by were candidates for this project. One after the other, I held a lace up to the piece to gauge whether it would work. I considered, I experimented, I asked friends….finally settling on, wouldn’t you know it, one of the first pieces I pulled out! I started by gathering the buttons I thought I had. And I kept finding more. There is no reason for *any* item of clothing in our house to require a button! Because I apparently have buttons for all occasions! Pretty awesome, yet to decide on one set of buttons….shall I just say there was some swearing involved. As well as some “set down the buttons and come back later!” moments. I think this part was harder than the darn lace! 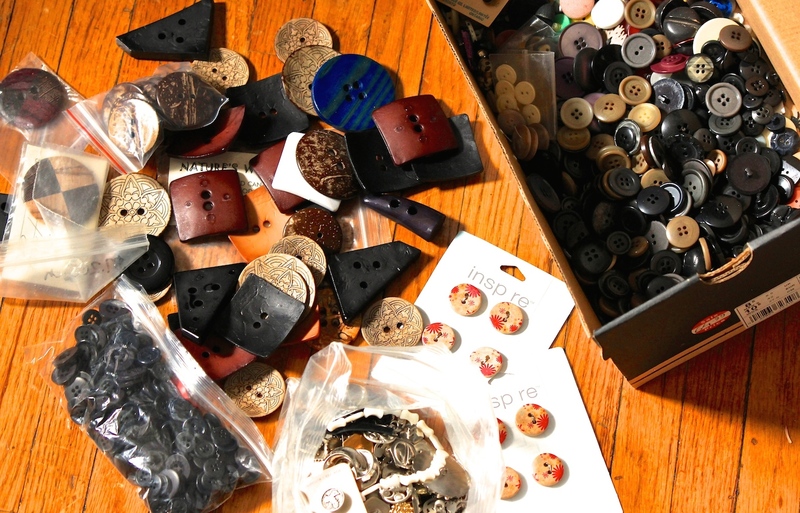 But eventually….finally…I chose a set of three buttons that I purchased over a year ago and that have been waiting patiently in a shoebox all this time for a perfect project to come around. The final addition was a bow of lace that I sewed up and added with a pin so it could be removed. Feeling pretty satisfied with myself at the end of it all. This lovely piece is now up for sale on my Etsy shop and I’m already thinking about making another. Although I really wish I could find more of those awesome spiral buttons!! !